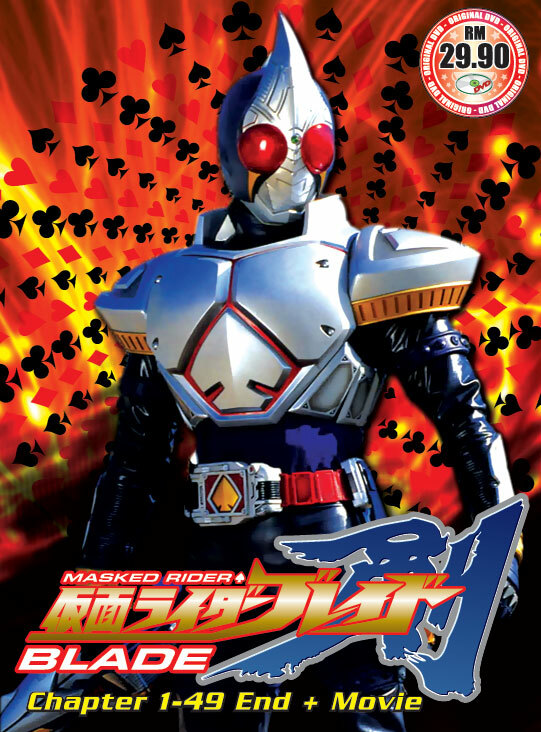 Kamen Rider Blade (仮面ライダー剣（ブレイド） Kamen Raidā Bureido?, Masked Rider ♠ (Blade)), is a Japanese tokusatsu superhero television series. It is the fourteenth installment in the Kamen Rider Series. It aired on TV Asahi from January 25, 2004 to January 23, 2005. It is a joint collaboration betweenIshimori Productions and Toei. Along with the standard insect motif of the Kamen Rider series, Kamen Rider Blade also uses a playing card motif. Each Rider is assigned one of the suits from a deck of cards. The series catchphrases are "Now, expand that power." (今、その力が展開する Ima, sono chikara ga tenkai suru?) and "Take the trump card of fate!" (運命の切札をつかみ取れ! Unmei no kirifuda o tsukamitore!? ).